From the tiny, winged Ellylon to treetop-tall Giants, this book brings 24 nonhuman fantasy races to GURPS. This book includes new, expanded versions of such fantasy "standards" as Elves, Dwarves, Orcs and Halflings, as well as exotic creatures such as savage Minotaurs, four-armed Insect Warriors and magical, mischievious Leprechauns. 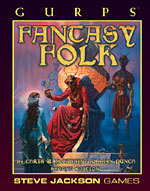 GURPS Fantasy Folk treats nonhuman races as unique cultures made up of individuals, not as sketchily-defined "monsters." Each race has its own well-defined psychology, ecology, culture and politics, making it easy for GMs and players to create their own fully-developed nonhuman characters. Also included are campaign notes, adventure seeds and sample characters for each race. And there are complete rules for generating your own fantasy races! The Fantasy Folk race creation rules allow the GM to customize his nonhumans. Included are racial advantages like Winged Flight and Cultural Adaptability, disadvantages such as Slave Mentality and Invertebrate, and unique racial features like Mindshare, Innate Skills and Magic Spells. 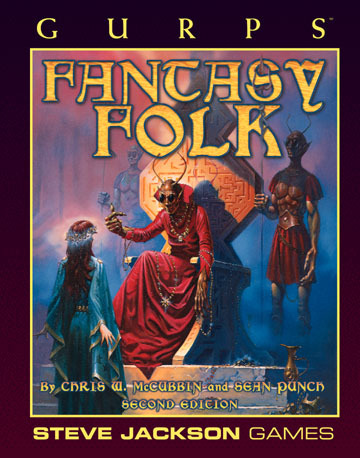 The Second Edition of GURPS Fantasy Folk adds 16 pages of new material, as well as bringing some of the older rules systems into line with the GURPS Basic Set, Third Edition. GURPS Fantasy Bestiary – More than 250 fantasy animals and plants, ranging from interesting nuisances to monstrous menaces.